We’ve covered Doomwatch before – the unlikely hit BBC TV programme about the exciting adventures of a Government department which aired for three series in the early 70s. Such a huge hit was the TV show, that to capitalise on its popularity, the film was released in cinemas in 1972, which was also the same year as the final series. Doomwatch is the nickname of the the Department of Measurement of Scientific Work which reports to the Department for National Security. It is possibly the most improbable basis for a creepy thriller ever committed to film; a bunch of scientists working for the government to make recommendations on scientific policy and legislation. But in the way the TV series used the special and legal ability of the department to legitimately stick their noses where nefarious business and scientists might not want them looking, the film allows the massive narrative advantage of giving the department immediate access to the subject under investigation. The characters from the TV show take a back seat here, residing in a Doomwatch office which is clearly benefiting from the bigger budget. This is no slightly flimsy set at BBC TV Centre – this office has heft and actually looks like a real lab with connected rooms. The members of the department are following other matters and other scientific problems which the government needs to know about. They are the senior folk now and despite probably being the people most of the audience would have come to see, stay ensconced in their Whitehall office while new boy Doctor Del Shaw (Ian Bannen) is dispatched to the island of Balfe off the coast of Cornwall to do some investigating. An oil spill off the coast of the island has prompted the department to check out the local (and very insular) village on the tiny island to make sure the pollution doesn’t have an adverse effect on the population and their fishing business. But there is more to the spill than meets the eye and locals on the island are spotted with facial deformities and aggressive characteristics which suggest that something very serious is being hidden. It’s almost like all the people on the island have started to de-evolve and it’s a race to discover what has happened and if Del can find a cure. All of the jigsaw pieces of a supernatural and very odd horror are in place here. 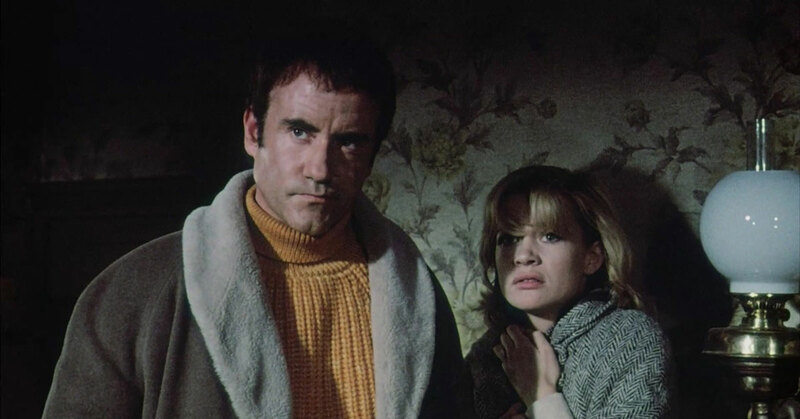 The production has a place in the series of unsettling British horror films like Straw Dogs (1971) and The Wicker Man (1973) which were popular at the time. With all those trappings in place though, audiences would’ve felt happy that despite its unusual presentation, the story of the film would have a scientific explanation at its heart. And so it comes to pass. It’s a matter (as it was in several episodes of the TV show) of whether the scientists will be believed or not. The film is very basically a much higher budget and lengthier episode of the TV show – it reuses themes and events which appeared in stories in the television series. There are two or three episodes in particular which owe much to the plot, and although not specific remakes of those episodes, the story-line of the film shows many similarities. Indeed, the script was written by Clive Exton who also wrote and directed many of the episodes of the show on TV. Ian Bannen as Dr Del Shaw gives a nicely underplayed performance. He’s a nicely introduced character too – there is no sense that he is out of place within the existing team, suggesting that he has had adventures with them in the past and might well have them again in the future. There is also admirable support from the actors playing characters on the island, most notably Judy Geeson as the local school teacher Victoria Brown. The movie is nicely paced; with a running time of 85 minutes it is actually 15 minutes under the length of two episodes stitched together. There is greater visual scope and certainly more money available to pursue the plot, but the feature film version of Doomwatch still feels very televisual in its story telling. In making the script stick to the formula of the TV series the opportunity to be more adventurous was lost. It might have been nice to see something really different. But at the end of the day the formula of the TV series had been successful for three series, so was probably a reasonable bet to make for any film producer looking for an audience. What the blu-ray release of the feature film version of Doomwatch has very much in its favour is the visuals; being entirely made on film for the cinema the negative has been restored and re-scanned into 1080p HD. The TV programme was shot, for the most part, (in typical 70s and 80s fashion) on video in brightly lit TV studios. The contrast between the two, and the curiously uplifting effect it has on the scale of the story telling, is marked. The feature film version of Doomwatch is available on blu-ray and DVD now. It’s an entertaining romp, and although it’s nothing particularly special in of itself, fans of the TV show will find it irresistible.